Cross of the Dutchman is, thematically speaking, a very interesting action RPG. It doesn’t involve a fantasy or sci-fi realm, not does it take place in a post-apocalyptic wasteland. Instead, the story is about a Frisian man called Pier Gerlofs Donia, who lived in the north of the Netherlands and has become somewhat of a local legend. Attributing great size and strength to the man, the story goes that he single-handedly fought off many of the invading Saxons back in the 16th century – and it’s a rich story if you start reading up on it as well. This sets the stage for a deep historic saga, but the game is in fact a “light” version of what we expected – almost bordering on casual at times. The combat in Cross of the Dutchman is rather simplistic, with tons of rapid mouse clicks usually being a perfectly fine recipe for success in battle. 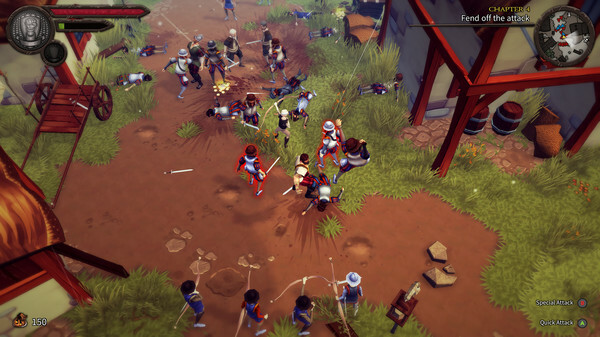 Health and stamina can be upgraded, and fairly soon you’ll gain possession of a sword, but the basic gameplay stays the same through the short length of the game – which comes in at about two hours. The game also features a few simple stealth sections, but these make very little sense. They’re okay by themselves, but in the context of a man who can take on several soldiers at once it seems rather silly that it’s “game over” the second he is spotted by one of them during these stealth sections. So with the combat, rpg dynamics, game length and story depth all being on the “light” side, is this still a game worth playing? We feel it is, at least as long as you go in expecting such a game. When you do, you’ll find that what’s there is well done and the backstory is certainly different enough to be interesting. It’s definitely not a classic, but Cross of the Dutchman tells an interesting story and at just two hours it’s short enough to not let its shortcomings get to you.